Location, location, location!!! Fabulous Sylmar home which boasts a front yard with mountain views, 5 Bedrooms, 2 Baths & 1556 sqft. This home displays the perfect blend between old world craftsmanship and modern style and functionality. Charming spacious living room, separate dining area and master bedroom with den and cozy wood burning fireplace. Beautifully redone with the warmth of a farmhouse meeting an industrial flair. Tile and laminate flooring and an exquisite gourmet kitchen with granite counter tops and a tasteful graphite farmhouse sink. The family chef will truly appreciate the abundant counter space and cabinets Layout of the home is perfect for a large family, offering privacy and gathering areas. Large backyard with a warm covered patio, which has an a full size beverage refrigerator. 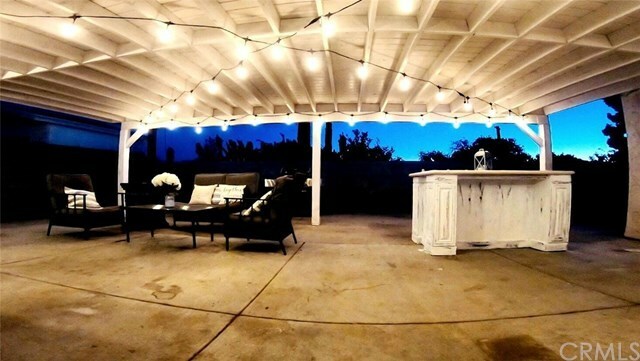 The backyard has breathtaking sunset views and is perfect for entertaining your guests! This gem sits in a quiet Sylmar neighborhood where you can enjoy the perfect picturesque bistro patio while listening to the birds during the day and the crickets at night. Close to shopping centers with easy freeway access to multiple freeways offering convenience for your commute to anywhere you have to go.. Come quickly this beauty will not last!! !